Face of woman painted in orange and red, as soon you look at the cover page of the book you’d think that the book is about a woman and her power. And, you’d be right. Cover does complete justice to the book. The blurb is captivating too and would surely make you want to read the book. 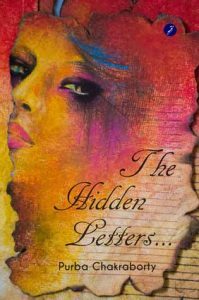 ‘The Hidden Letters’ is the story of Anaya, top-most Author in India, with a global recognition. In her forties she is living in Singapore with her husband Nishith (a doctor) and her eighteen year old daughter Olivia. The story opens at an event n Kolkata where Anaya receives a prize. Later in Kolkata she comes across her Varsha, her cousin and best friend from her past. She tries to talk to her, but Varsha don’t even recognize her. From her attending Nurse Anaya learns that Varsha suffers from Alzheimer’s and is unable to remember anything. Instantly, Anaya is filled with a guilt. She just cannot take her mind off Varsha even after returning to Singapore and meeting her husband. She believes that it is her fault for the condition Varsha is in. Anaya thinks about the letters hidden in a safe written by Varsha years ago. The story goes back in time when Anaya met Nishith for the first time while living with Varsha. In beginning she thinks Nishith is just a rude, careless goon, but as time progresses the three of them become best friends. Eventually Anaya falls in love with Nishith. Now what’s in the letters? What exactly happened between the three of them? Why Anaya blames herself for Varsha’s condition? I am sure you have all those questions. But… I will not answer. You’ll have to read the book to find the answers. I must congratulate Purba for writing a very captivating, engaging storyline. It’s a well written piece and until the very end of the book it will keep you amused. The plot is great, and well-written. The suspense factor keeps the reader glued. There is a perfect mix emotions, love and romance with pain and thrill. The story is weaved in a manner that at each point you’d be assuming things only to find out that you were wrong. Especially, how the story switches between past and present leaving several questions in your head, it only make you want to read the book further to find your answers. I must agree that the author has good command of the language, and knows how to write a perfect story. Writing style is engaging, amusing. Grammar is excellent. Vocabulary is great, fitting seamlessly to requirements of the storyline. However, there are some printing errors and the publisher should have taken care of that. Characters are written well, and could be easily related to. They fit well in the story and do the justice. All characters are lovable, whether it’s the protagonist Anaya, her husband Nishith, he daughter Olivia, her Cousin Varsha, or her friend Zeeshan. Only thing I didn’t like was why did the couple had to be the best in what they did: Anaya being the topmost author of India and Nishith being the topmost Cardiologist. This was a little pretentious, only thing that I disliked in the whole book. The books is well-paced, with adequate mix of suspense, emotions, twists and turns. The fact that you don’t want to put the book down is a proof that it’s paced appropriately without a single place where you’d get bored or feel disinterested. The resolution was perfect. There couldn’t have been a better ending to the book. Just when the end approaches it really fills you with a lot of emotions and concerns. And right at the end… well you’ll have to find that out yourself. Overall, it was an excellent read. Refreshing, engaging, total worth of time. Brilliant plot, lovable characters, well-paced, and with outstanding resolution. What else could you ask for? 4 Stars out of 5. Recommended to all readers who love emotions-rich romantic stories, full on thrill. Overall, it was an excellent read. Refreshing, engaging, total worth of time. Brilliant plot, lovable characters, well-paced, and with outstanding resolution. What else could you ask for?Recommended to all readers who love emotions-rich romantic stories, full on thrill.